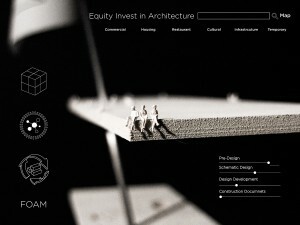 FOAM is an equity crowdfunding platform for the architecture industries where users can invest in projects as financial stakeholders with spatial assets. Public space has shrunk to the size of our dreams, with invisible financial forces manifesting themselves as luxury living, driven by revenue and economic potential. FOAM begins with the negative space of the city. In the negative space there are small scale projects of urban development that the public can invest in and the architect can envision. This is a process that will develop over time, through which privatized space can become privately owned by the public, and a new collaborative process will emerge where the lines between developer, architect, and end user are more blurred than they have been historically, into a mesh of non-hierarchal users. Over time, a decentralized redefinition of ownership in the city absorbs buildings, with the architect orchestrating economic thresholds of projects funded by the end user. Through the FOAM interface, the city is absorbed by foam space. Each layer represents the passing of time during which our interface has absorbed more of the city. Emptiness is a structural component of air suspended in individual bubbles of foam. The architectural expression of FOAM manifests an appreciation of value in material and spatial markets of exchange. Parks, streets, sidewalks, rooftops, balconies, airspace, lawns, gardens, backyards, and inaccessible empty real estate suddenly become an investment opportunity. The notion of collectivity and connectivity are transformed by a communal sharing project: initiated by the architect and completed by participants. On a global scale, a multitude of self-initiated crowd-equity projects will proliferate, and shares will be held in spatial investment portfolios; a portfolio of shares in interdependent spaces that can be traded on secondary exchange markets. An architecture that is capable of restructuring spatial regimes of power must be financially profitable. Log into FOAM on the Wi-Fi list from your phone or tablet to access our interface and invest in shares of our space NAVEL. NAVEL is a test site for collective enterprise that monetizes the process of intellectual stimulation and productive dialogue from active agents of a communal cultural exchange platform. By situating NAVEL where infrastructure meets territory, new constituencies and cultural diplomats will be assembled. As anyone can produce for and consume from the NAVEL workspace, it becomes an open-source brand. 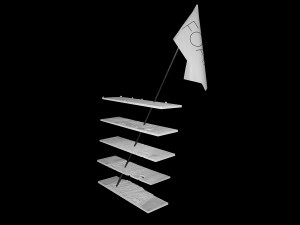 NAVEL operates with an understanding of the new shared economy and is managed on FOAM, a platform that returns agency to the Architect. Space can no longer be valued abstractly on financial markets, and instead needs to be assessed in tangible, material, and spatial indicators of value. In the sharing economy, we need more than public space; we need to be absorbed by foam space. FOAM is a project management and crowd-equity funding platform for the architecture industries, secured by blockchain technology. Architects are creatively and entrepreneurially constricted by their reliance on clients for work. Additionally, architects do not retain a financial stake in the spaces they design. FOAM enables architects to connect and collaborate with each other, manage teams, initiate projects, and access capital funding from crowd investors. FOAM allows the end user of space to become a financial stakeholder, increasing public accessibility to architecture. FOAM envisions an ecosystem of empowered architects, public investors and new spatial markets of value exchange in the city.